– Do you write down your priorities? Do some things seem less urgent when you look at them in the light of your priorities? – Do you ask yourself which of several tasks is the most important one before you decide what task to tackle next? – Do you accept full responsibility for missing a deadline, rather than blaming it on forces beyond your control? – Do you focus on finishing a job on time, rather than looking for excuses to explain why you’re going to miss another deadline? – Do you make sure people know when not to disturb you? – Do you have a habit of turning off the phone when you need to concentrate completely on a job? Do you focus on the job at hand, rather than fretting over what went wrong in the past? – When you’ve done your best, do you know when to wrap up a project?-Do you feel that spending more time on it will only keep you from starting your next job? – Always remind yourself that you have as much time as people who do great things. – Make your best estimate of how much time a task will take. 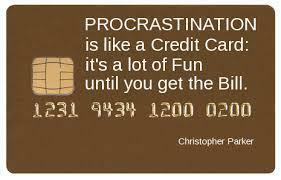 – Write an inspirational phrase on a 3 x 5 card and use it whenever the procrastination monster pops up. Shakespeare said, “Thoughts are but dreams till their effects be tried.” You’ve taken the first step to defeat procrastination by reading this article; now take the next step and tackle a job you know you should have started a long time ago. I took my next step this morning-I got up earlier than usual to start my novel. 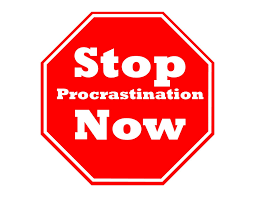 Let’s stop procrastination and get it done! Decorate your Office for Success!